Leslie Birch Featured on Geekadelphia #WearableWednesday « Adafruit Industries – Makers, hackers, artists, designers and engineers! Geek of the Week on the Philadelphia blog Geekadelphia is our own Leslie Birch! 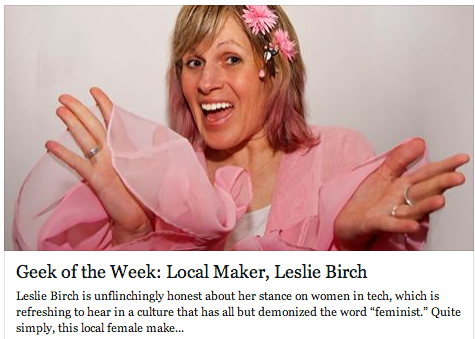 Leslie Birch is unflinchingly honest about her stance on women in tech, which is refreshing to hear in a culture that has all but demonized the word “feminist.” Quite simply, this local female maker wants more women in tech and works hard to promote a culture of innovation and inclusion. Impossibly boundless in her energy and optimism, Birch is also a dauntingly capable person to be around. It only takes a few seconds of show and tell to notice that Birch approaches making the same way she approaches feminism in the maker community: fearlessly. Her vision extends from wearables to robotics, and her appetite to make and teach other to make shows no signs of slowing down. Her many projects (and their many accolades) include NASA Space Apps award-winning Senti8 and international Adafruit + element14 Design Challenge’s FLORAbrella. She is also an artist and mentor, spending time at the Village of Arts and Humanities and at the Philadelphia Free Library for Maker-Jawn in April. Among her numerous maker projects, Birch also runs her own video production company for nonprofits called Human+Nature.